Ruby + Swallow: Spotlight on the 54th Grammy Awards! Spotlight on the 54th Grammy Awards! This post contains information about the winners. You have been warned! So the Grammy Awards have barely even finished, and we're already bringing you the scoop on who won and who wore what! Ah, the Grammy's. This is the music industry's biggest night but it can often be the craziest night as well! Last night was no exception. We never know what to expect and each year is different - whether it's Lady Gaga showing up in some outrageous ensemble or Kanye West speaking his mind, the Grammy's are never boring! Kanye West earned seven nominations and Adele cracked six nods; but how many did they go home with? Keep reading for a round up on nominees and winners, and what we thought about this year's fashion! Adele looked fab in her glittery black gown teamed with bright red lips. Even after her throat surgery, she wowed at the Grammy's with her amazing performance; we might as well just call this year The Adele Awards after she won all six Grammy's that she was nominated for - she nailed it! The Foo Fighters also emerged as big winners, capturing five of the six categories they were nominated in and Kanye West, who was the night's top nominee with seven, won four awards. Glittery gowns and high necklines were all the rage at this year's Grammy's, with the best dressed stars donning both! 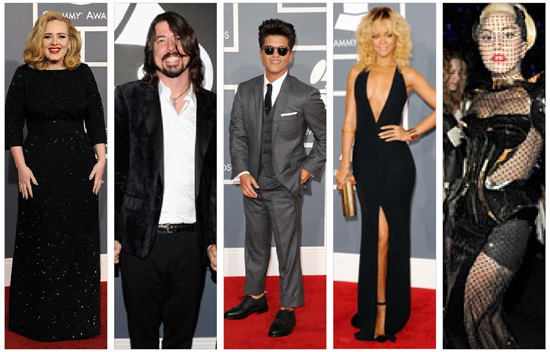 Below are some of this year's Grammy's worst dressed celebs - how do you think they fared? Fergie kills her Jean Paul Gaultier gown with tasteless black underwear, and the guns on Sasha Gradiva's dress - NO words! Nicki Minaj did a "Lady Gaga" this year and stole the show! As for the rest of them, we're not sure if they're even worth mentioning. But really, WHAT were they thinking? !